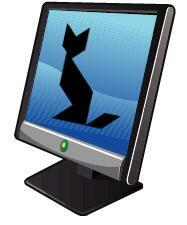 Watch the Links Learning Geometric Shapes with Tangrams lesson with students. A whiteboard, LCD projector, or large monitor should be used for this class presentation. Each student should have a rectangular sheet of construction paper and a pair of scissors so that he/she may create the tangrams while watching the presentation. The presentation is designed to pause while students follow each set of directions to create the tangram pieces. The teacher may use the navigation buttons to repeat the directions, as needed, before clicking on NEXT to see next segment in the presentation. The presentation identifies tangram pieces by geometric name as they are created, and discusses vertices, sides, congruent sides, congruent angles, etc. as they apply to the shape. Before cutting the next piece, the current tangram pieces are placed on a second sheet of construction paper to eliminate accidental cutting of these pieces. Provide students with a second sheet of construction paper which they label Tangrams and use as a bank for tangrams throughout the process. After creating the different pieces, students will be asked to use the online tangram pieces to create the shapes shown on the computer. For this whole class presentation, ask students to use their own tangram pieces to create the shape on the screen. Walk around to monitor student proficiency in rotating the tangram pieces to form other shapes. When students have completed the task, click on the ANSWER button so that students visually see the pieces rotated to cover the given shape. have these students watch the presentation with earphones at a classroom computer, following along with the class in creating the pieces. Using their own computer places the student closer to the object, making the hand-eye coordination less of a distance problem. Introduce elementary students to the concept of tangrams by reading one or both of the these books. Both books tell a story through tangram illustrations. Teachers should read the story for enjoyment, then provide tangrams and full-size templates of the tangram figures from each story for students to cover with their tangrams. Three Pigs, One Wolf and Seven Magic Shapes by Grace Maccarone is a mathematical take on the classic fairy tale. Students are introduced to tangrams in this leveled reader. 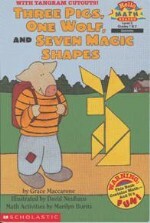 The pigs use the seven magic shapes to form solutions to the problems they encounter. Students will enjoy using tangrams to recreate the figures in the book as well as creating their own tangram figures for classmates to solve. Download the Seven Magic Shapes Templates that show individual pieces so that young students can position tangram pieces correctly to form the characters in the book. These templates were designed to be used with commercial tangram pieces. Download the Seven Magic Shapes Shadow Templates that show black shapes so that students must figure out how to position tangram pieces correctly to form the characters in the book. These templates were designed to be used with commercial tangram pieces. Download the Tangram Shapes Template can be used to create tangram pieces to use with templates above if commercial tangram pieces are not available. 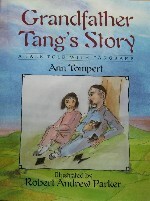 Grandfather Tang's Story by Anne Tompert also uses tangrams to illustrate the story a grandfather tells his granddaughter. Students will enjoy recreating the tangram creatures found throughout the book. Assemble the tangram pieces to replicate figures in the book. Trace around the outside of the figures then fill in the shape with black marker. These are best traced onto oaktag or card stock and laminated before use. Place the tangram characters and tangram pieces in your math center for students to try during center time. Ask students to create a new character for the book and make a tangram mat for the character that can be added to the tangram center for classmates to try. Tangram Magician by Lisa Campbell Ernst is similar to Grandfather Tang as the magician changes shape throughout the story. The Tangram ABC Book by T. Foster presents several tangram puzzles for each letter of the alphabet. For example, the letter A shows armadillo and airplane. Then and Now on Old MacDonald's Farm by T. Foster uses tangrams to tell the traditional story. These sites provide additional tangram activities for students. Print and cut out a Large Tangram Pattern or a Small Tangram Pattern for student use if tangram manipulatives are not available. Students may also use these paper tangrams to record their own tangram creations on a class bulletin board/math center or in a class tangram booklet. Tangram Worksheet encourages students to explore by using some or all of the tangram pieces to make familiar shapes: rectangle, square and trapezoid. PBS Kids Cyberchase Tangram Game allows students to elect lines on or off to create the figure using easily maneuverable tangram pieces. The Math Forum Tangram Web Unit includes lessons on constructing your own set of tangrams, the area of tangram pieces, more tangram activities and other tangram resources. Math Forum's Tangrams and Fractions encourages students to investigate the fractional part of the whole square that each tangram piece represents. By changing the "whole," the fractional parts are also changed, presenting activities that develop a conceptual understanding of the area model of fractions. NCTM's Tangram Puzzles and Tangram Challenges help students develop spatial skills through the use of interactive applets to investigate tangram puzzles. NVLM's Interactive Tangram is easy to use for a whiteboard demonstration of tangram shapes or for individual student use in a math computer center. The Centre for Innovation in Mathematics Teaching's Tangram Unit has additional puzzles. Find more tangram ideas at Tangram Puzzles, including people and animals shapes that may be downloaded for student use. An answer sheet is also available, making this an excellent resource for math centers. Tangram Activities for Grades K-12 provides suggestions for using tangrams at different grade levels. Check out the Tangram Zoo for some tangram animals that might be used in conjunction with a science unit. Tantalizing Tangrams incorporates transformations in an exploration of tangrams. Download Tangram Fractions for student worksheets that investigate the different shapes that can be formed from using 2-7 tangram pieces. Invention Playhouse's Puzzle Blocks are similar to tangram puzzles. Younger students may click the Help button to see the outline of pieces in the puzzle shape.